I refused to touch it raw. Instead, I read the directions to the recipe -- handing off ingredients when necessary. Stephen massaged the tilapia with olive oil first. Then rubbed in a mix of spices. I preheated the oven. Stephen placed the the fillets on foil to bake. This fish dinner was . . . happening. 17 minutes at 350 degrees. The tilapia turned from a light pink to an opaque white. It didn't smell as fishy as I worried it would. (For that, I was ever-so thankful.) And still, the idea eating it -- the e.n.t.i.r.e fillet -- felt incredibly strange to me. The first bite was rather anticlimactic. It tasted like nothing, really. Well, nothing . . . cloaked in cayenne pepper. (I think I may have added too much on purpose, like how I used to drench steak in A1 Sauce.) I worried mostly if it was cooked through. 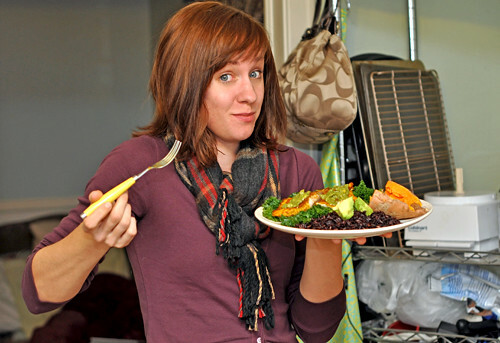 You see, I have such little experience with fish, chicken, beef, etc. (If we're being honest, I've only ever cooked shrimp. Once.) So, I don't know what's considered "done" or "safe" or whatever other words you use to describe OK-to-eat-ness. Instead, he kept chewing and commenting on the bold flavor and how well the avocado spread muted the fire-hot spiciness. Dare I say it was . . . good? Maybe even better than good, but the "ick-factor" had set in, and I only finished half of mine. Stephen happily forked down the rest. 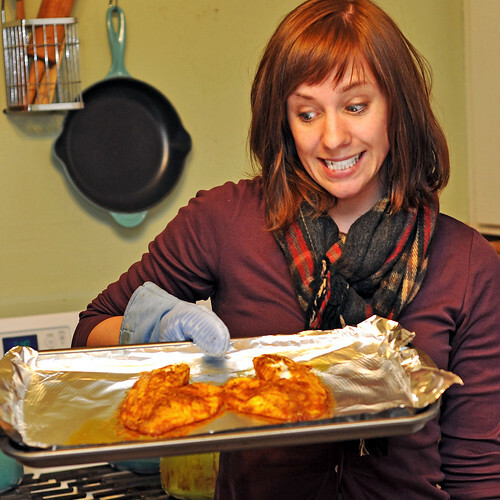 Preheat your oven to 350 degrees F. Get out a rimmed baking sheet and line it with some foil. Massage 1 tablespoon of olive oil into each fillet -- cover both sides. 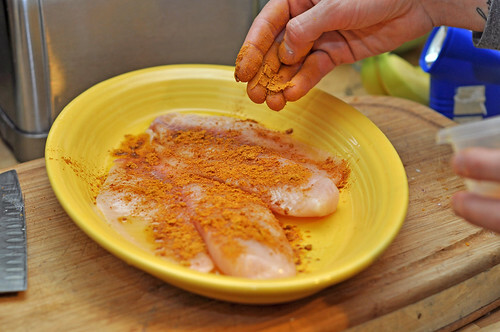 Mix together the spices -- including the orange zest -- and then rub it onto both sides of each fillet. Transfer to the baking sheet and then grind a bit of fresh pepper on top. 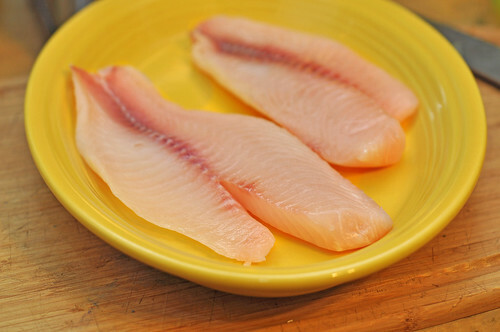 Bake in preheated oven until the tilapia is no longer translucent and flakes easily with a fork, about 15 minutes. Then turn on your broiler and continue cooking for another 2 minutes or so. 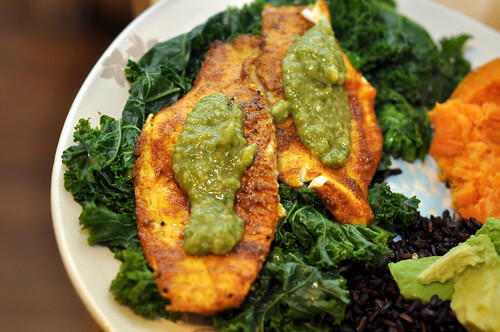 Serve over a bed of cooked kale. 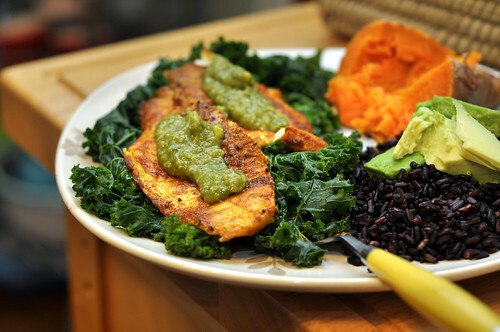 With black rice and a sweet potato on the side. And you MUST try the sauce! That was my favorite part! 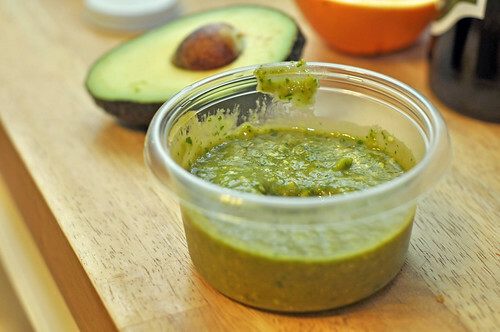 In a food processor, blend together the basil leaves, fresh orange juice, honey, garlic, avocado, tamari, and sesame oil. Then squeeze the juice of the ginger into the mix and stir in the sesame seeds. Add pepper, if desired. Spread liberally on the fish when you're ready to eat! Thanks to everyone on Twitter who helped us decide which fish would be my first. What new thing have YOU tried recently? Please share with us by leaving a comment or emailing us at neverhomemaker [at] gmail [dot] com.